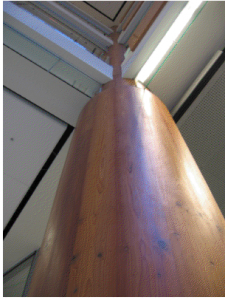 A giant tree that had to be removed during construction was cut and used to cover a column from the lower level all the way up to the 8th floor, one of many environmentally friendly practices incorporated into the library's development (King Library photo). Hard work by the Dr. Martin Luther King Jr. Library design and operations teams has paid off. The seminal structure was recently awarded LEED© silver certification for its environmentally friendly features. 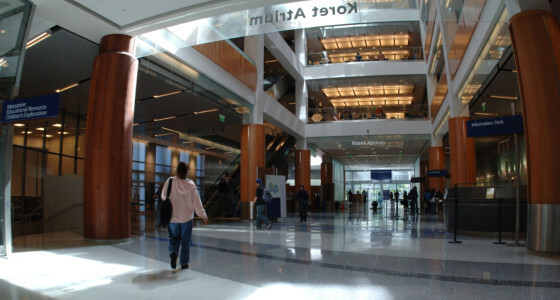 “It’s a significant achievement for our campus community to have a library that is energy efficient, healthy for its occupants, and doesn’t harm the environment,” said Tung Pham, library facilities and purchasing coordinator. The United States Green Building Council administers the Leadership in Energy and Environmental Design (LEED) program, a rating system used to measure green building design, construction and function. Buildings are measured against a 100-point scale, and credits are weighted to reflect potential environmental impacts. The four levels of certification are certified, silver, gold and platinum. “In the long run, I believe the way we operate the building can be more important that how it was built,” Pham said. Over the last three years, a committee worked on LEED certification requirements in the following categories: water efficiency, energy and atmosphere, materials and resources, indoor environmental quality, innovation and design, and sustainable sites. Tours focusing on the library’s design and green/sustainable features (in addition to collections and art) are available every Thursday at 11:30 a.m.